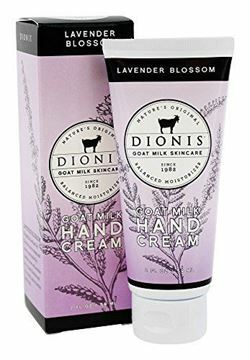 Dionis Hand Cream is a rich, creamy non-greasy formula that leaves your skin soft and hydrated. This "Lavender Blossom" scented hand cream absorbs quickly, helping to keep your hands moist and beautiful', 'Fragrance Description: Lavender Blossom is a delightful Aurelian lily blossom, juicy orange and casis surrounded by jasmine, rose and lavender on a creamy background of coconut, apricot, nectar and musk. ', 'The goat milk, and vitamins A and D also keep your skin looking great naturally. ', "At Dionis we know that when your skin feels great, you feel great. That's why we have dedicated more than 30 years to promoting the moisturizing benefits of goat milk. ", "Dionis' products are not tested on animals. Paraben Free. Gluten Free." 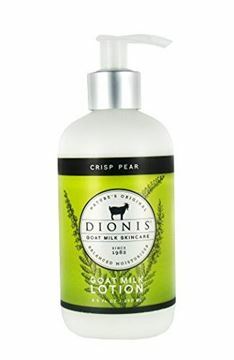 Dionis Goat Milk Skincare - Lotion Crisp Pear - 8.5 oz. 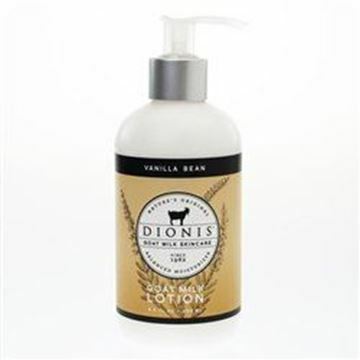 "Nature's Original DIONIS Goat Milk Skincare", '8.5 fl oz', 'Vanilla Bean scented', 'Fruit & Spice Collection for 2014', "At Dionis we know that when your skin feels great, you feel great. That's why we have dedicated more than 30 years to promoting the moisturizing benefits of goat milk."